Is Your Cheese Killing the Planet? We all know that meat is terrible for the climate. A new report from the Environmental Working Group tells you which meats are the worst in terms of greenhouse gas emissions, as Tom Laskawy reported last month. But one finding in the report surprised (and alarmed) me: Cheese is quite hard on the climate too. EWG worked with CleanMetrics, an environmental analysis firm, to rank different protein sources in terms of their life-cycle greenhouse gas emissions per four-ounce serving. Beef, as you’d expect, is bad—No. 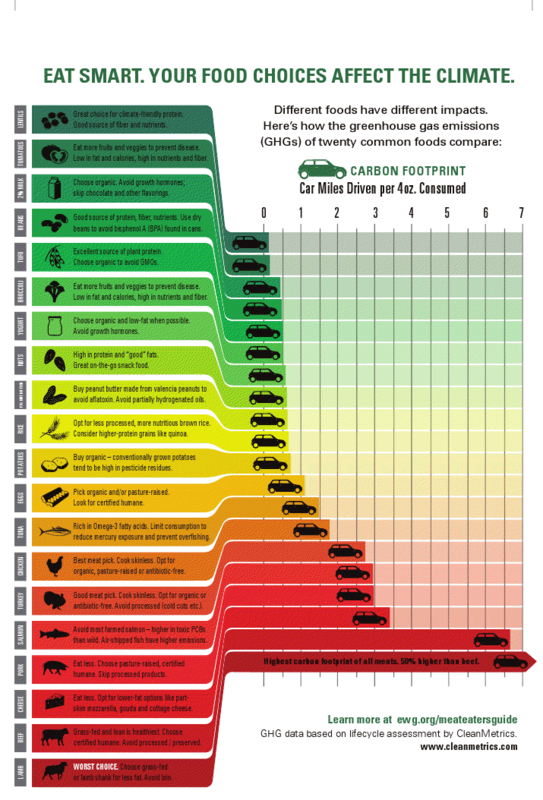 2 on the list in terms of climate impact, surpassed only by lamb. But the No. 3 offender is cheese, ranking worse than pork and chicken ounce for ounce, and substantially worse than other dairy products like milk and yogurt. The report analyzed a conventional confined dairy operation in Wisconsin. But what if you buy your cheese from a local maker who lets her animals range free? Even happy, local, grass-fed cows belch out a lot of methane, so cheese made from their milk is not necessarily better in terms of greenhouse gas emissions. It depends on what specifically the cows eat and how much milk they produce. What’s a responsible cheese lover to do? If you’re not ready to go vegan, here’s some advice. “Your best bet is always to support your local producer,” says Hamerschlag—particularly ones who use sustainable, organic, and humane methods. “Well-managed, grass-fed systems generate far fewer environmental impacts, and they’re certainly a more ethical way to raise animals, and also more nutritious in terms of the output.” Sustainable dairy operations lead to reduced use of chemical fertilizers and pesticides, less water pollution, healthier soil, and more habitat for birds and other critters. Dairy farms can also help keep land developers at bay, preserving open space. Climate change is important, but it’s obviously not the only value to consider. Are greenhouse gas emissions lower for cheeses made from goat or sheep milk? Nope. Finnish researchers reported in 2008 that goat cheeses are roughly similar to cow cheeses in terms of emissions, while sheep cheeses are worse because sheep emit more methane per unit of milk produced. Overall, EWG recommends opting for lower-fat, less dense cheeses. In general, the lower the fat, the lower the greenhouse-gas emissions, because when some fat is removed from the cheese-making process and used to produce, say, butter, some of the climate impact is removed from the cheese as well. Also, because toxins build up in fat, lower-fat cheeses can be better for your health. Cottage cheese is just about the lowest-fat option out there, while regular cream cheese is one of the fattiest. I was surprised to find that cheddar tends to be a higher-fat cheese, more so even than brie or Camembert. Go figure. Low-fat options include ricotta and part-skim mozzarella. High-fat cheeses include mascarpone, stilton, and colby. The EWG study didn’t differentiate between varieties of cheese (check out the study’s methodology [PDF] to find out more). I’d love to hear from any cheese makers or other experts who might be able to shed more light on the processes and potential impacts involved in producing different kinds; all insights welcome in comments below. Steve Zeng, a dairy researcher at Langston University, singles out feta cheese as one of the best options in terms of processing impacts and notes that chèvre, brie, and Camembert are also pretty green. Same goes for American’s top-selling cheese (mozzarella), since it doesn’t require any aging. Keep in mind that the EWG study compared protein sources on an ounce-by-ounce basis, which might make cheese look worse than it deserves to. While it’s common for someone to eat an eight-ounce steak for dinner, few people will consume an eight-ounce block of cheddar in one sitting. Cheese tends to be eaten more sparingly, as an accompaniment or ingredient rather than a main dish (unless you do a lot of your dining at greasy spoons and fast-food outlets). Ultimately, it’s better for the planet to eat fewer animal products. No surprise there. And most of us could benefit from eating less cheese in particular. “Americans now eat an average of 33 pounds of cheese a year, nearly triple the 1970 rate,” The New York Times reports. “Agriculture Department data show that cheese is a major reason the average American diet contains too much saturated fat.” The uptick in cheese consumption has come about in part because a marketing arm of the USDA has been pushing cheese in order to help the dairy industry. One of its successful efforts has been getting restaurant chains like Pizza Hut and Taco Bell to make incredibly fatty products that incorporate up to six different kinds of cheeses. The EWG study is a good reminder that even a vegetarian diet can have a notable climate impact. But if you’re eating little or no meat, you’ve already made huge strides in cutting down your carbon footprint, so you don’t need to feel too guilty about mixing a moderate amount of cheese into your diet. Just buy from local, sustainable purveyors when you can. And don’t buy more cheese than you’ll actually eat; discarded food is responsible for about 20 percent of the emissions associated with dairy products, EWG found. Bottom line: The vegans are right. But if you think, as I do, that cheese is luscious and divine, at least there are ways to make your consumption more eco-friendly. This post was produced by Grist and is reproduced here as part of the Climate Desk collaboration.